We believe that your child deserves a great haircut, and it’s important that they are able to remain happy and stay still so that the stylist can do her best work. We’ve found a great formula to help us achieve this goal. Your child will be seated in a colorful little car of his or her choosing, and everything from the work tables to the walls are decorated in bright colors and patterns that are designed to hold your child’s attention. 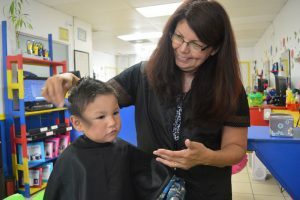 During the haircut, your child may watch his or her favorite movie or cartoon, play a game on an iPad or an Xbox 360, enjoy a favorite candy or play with fun toys. Of course, parents always have the final say in what their child is allowed to do during the haircut. Those bringing their child in for their very first haircut may choose a special service for $16 that provides before and after photos in a frame, a certificate and a lock of your child’s hair tied in a ribbon. Other services include the following. Because many hair products are capable of causing damage to our shears, we ask that parents remove any product from their child’s hair prior to the visit. Otherwise, we will require a shampoo wash before a haircut.